Clementi Park is a freehold condominium located in the Sunset Way residential estate away from the hustle and bustle of the city life, yet conveniently close to the Holland Village, Orchard Road, Bukit Timah Road, Pan Island Expressway and Ayer Rajah Expressway. Most of the apartments has a big balcony and a spacious layout. 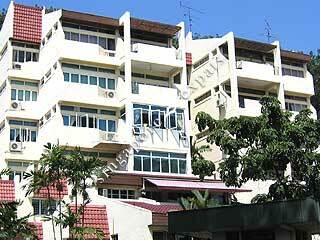 Because of the age of the condominium, renovated units are recommended. Best for people who long for more space in a crowded country like Singapore. Great for a young family. Spacious living area for entertainment. Entrance is full of foliage. Superb big vicinity, resort style living! MNake sure you find out about the house rule if you are interested to take up residence here, the condo management do not apply the house rules fairly and transparently. One rule for the geese, another for the gender, worse of all, there is no way one can find redress.